Having a baby girl this winter has had our family cooped up more than usual! I’ve been looking around and noticing everything that needs a little TLC this spring. Our windows need to be washed, and we’ve tracked in salt, sludge, and dirt from another snowy winter. We even have dust hiding in little corners from our first-floor remodel. I actually really enjoy cleaning, but it’s tough to find time with three little ones that need something from Mom more often than not. 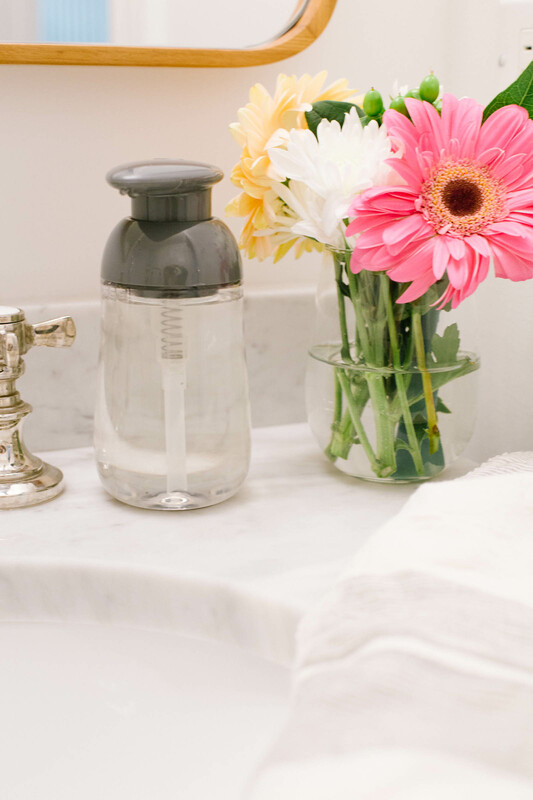 This year I’m teaming up with OXO to make spring cleaning a cinch. 1-Make a list. Make a to do list of what you need to get done. Clean the garage, bring out the patio furniture, change your furnace filter, tackle the dirty bathroom. Clearly putting down on paper what you’d like to accomplish helps you tackle each project, one at a time. 2-Do a little each day. Life can be busy. Having a newborn, I have short little pockets of time during the day to accomplish what I need to get done. This includes cleaning. Just remember Rome wasn’t built in a day, and if you allot yourself time like I do, you will get done what you need to. 3-Get the best tools. It’s time to graduate from just using a rag and cleaning spray! 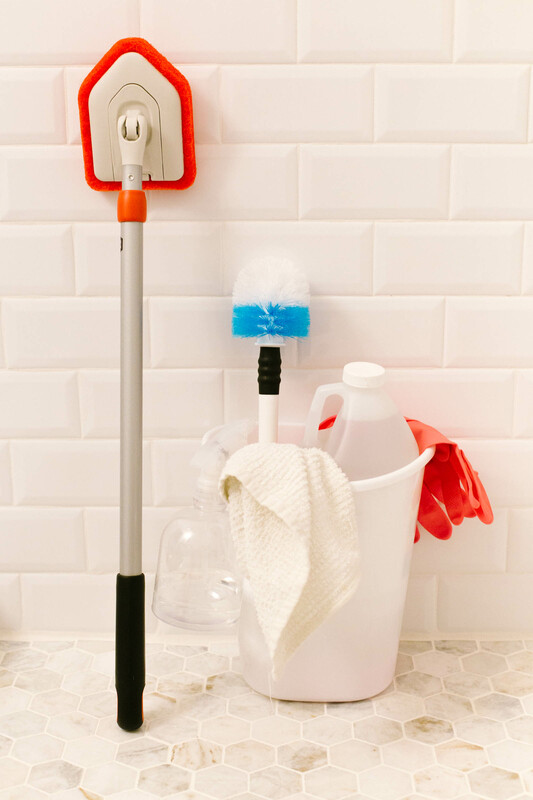 Equip yourself with handy dandy cleaning tools to save on time. There’s no reason not to use cleaning products designed to make the job easier! I recently tried the Extendable Tub and Tile Scrubber by OXO. It makes bathroom cleaning that much easier. 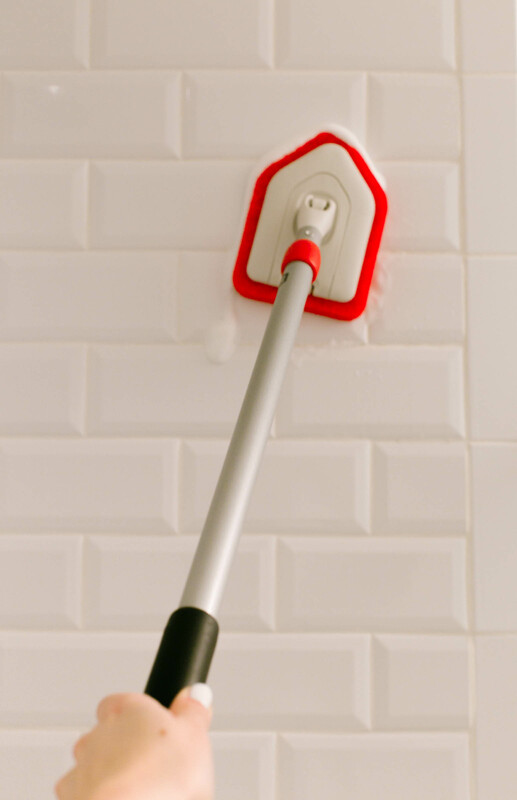 You can clean your shower floor, walls, and ceiling all while in one position. The head pivots to reach any angle so no more trying to balance on the edge of your tub to get to those hard to reach areas! 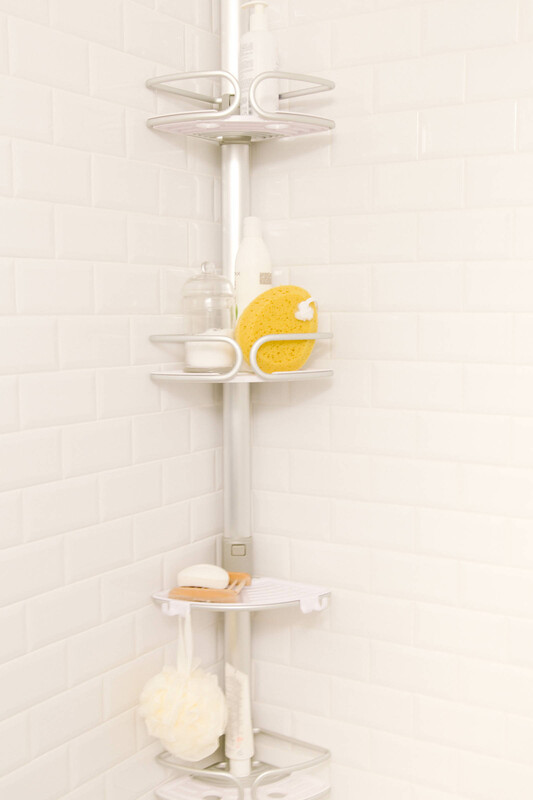 The OXO Quick-Extend Aluminum Pole Caddy for the shower makes spring cleaning easier too. 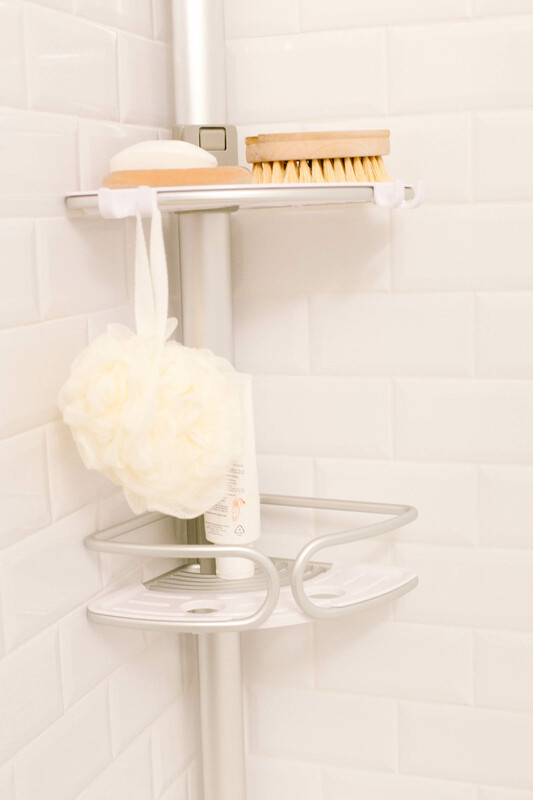 The easy-to-install, rust-proof caddy keeps all the shampoo, conditioner, and soap bottles off our shower floor and keeps it organized. Translation: less time moving things around to clean. 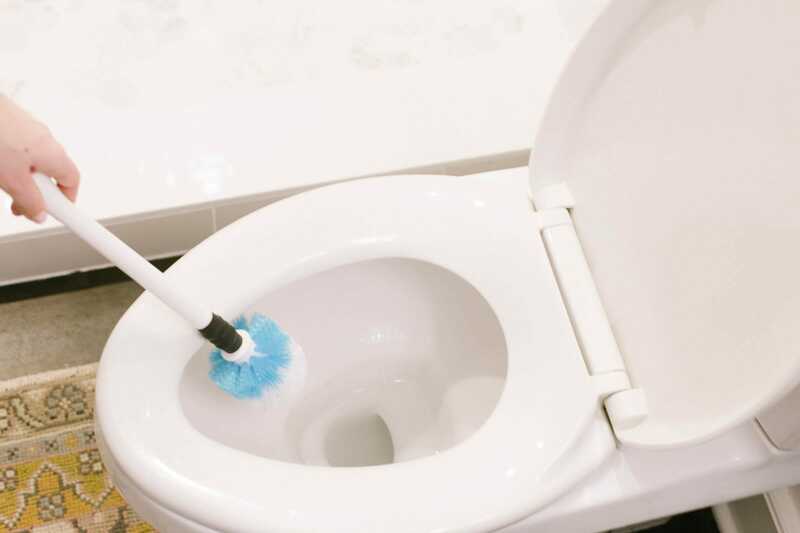 Also, the Flex Neck Toilet Brush gets into those hard to reach spots, including under the rim. 4-Know when to outsource. Time is money, and your time is precious. While I can tackle a lot of inside projects, getting up on a ladder to clean our exterior windows is not happening, and not safe. Know when you need to call for help. 5-Make it fun. Crank the tunes, listen to your favorite podcast, have fun with it. Cleaning doesn’t have to be a chore, and you’ll be proud of what you’ve accomplished as you reap the benefits of your hard work. Don’t forget to visit the OXO website to be entered to win the Spring Cleaning Sweepstakes. Do you have any great spring cleaning tips?